The account owner or admins can choose how long chat messages are stored on the Zoom cloud and on local devices. This will delete all messages after the designated time frame. 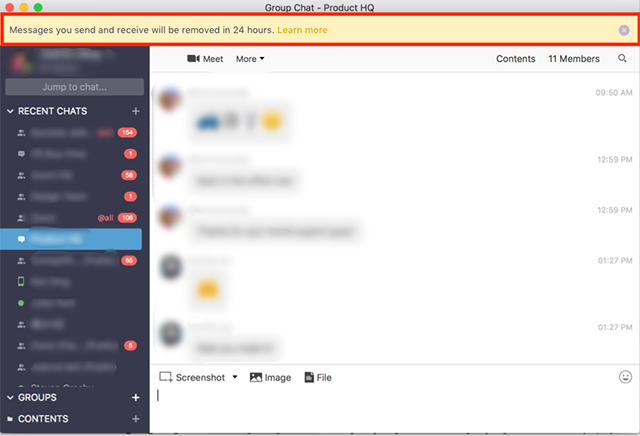 If messages are being stored for 1 month or less, a yellow banner will appear in your Zoom chat window, notifying the members of your account of how long messages will be stored. Messages stored on the cloud will be available on any device that a user signs into, until the selected length of time has passed since the message was received. The maximum length of time that messages can be stored is 10 years and the minimum amount of time is 1 day. By default, messages are stored on the cloud for 2 years and messages are stored on local devices for 1 year. This length of time can be changed by the account owner or admin in IM Management and changing this setting will affect all users on your account. The time frame is dependent on when the message is received. For example, if you choose to delete all messages after 3 days, they will be deleted 3 days after they are received by any of the recipient’s devices. Login to the Zoom web portal and navigate to IM Management. Below Local Storage, select how long you would like the messages to be stored on the desktop computer and mobile device. Next to Cloud Storage, toggle the setting to on (blue), if currently turned off. Select the length of time you would like the messages to be saved for. Recommendation: If you shorten the length of time that messages are saved for, you will need to notify all users on your account. Messages received before the setting was changed will be deleted after the designated length of time. For example, if you change the setting to delete messages after 3 days, any messages received prior will be deleted 3 days after the setting is changed.